Ben Rose says he was sitting in his apartment last week playing Fallout 4 when he was hit by a runaway Hyundai Sonata and badly injured. Wait, what? 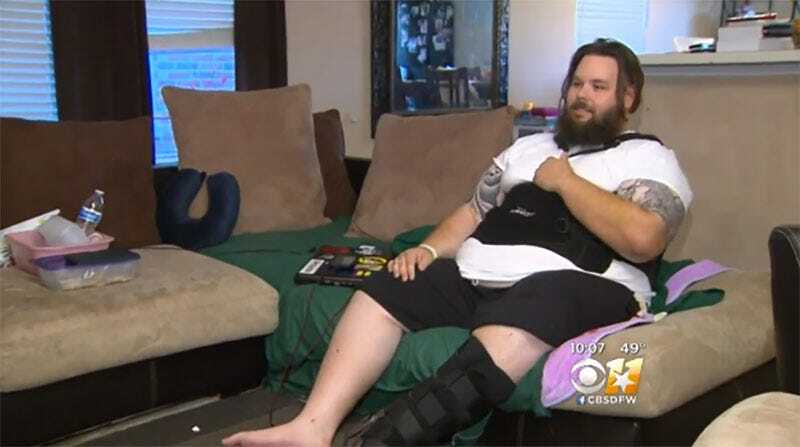 As CBS’ local affiliate reports, the Irving man says he was in the middle of a Fallout 4 session on his Xbox One when the car, with an uninsured driver behind the wheel, drove straight through the wall of his apartment. Rose suffered a fractured vertebra and “sliced his Achilles tendon”. Given what happened, his injuries could have been a lot worse, but Rose reckons that he was spared further damage by the fact he was sitting in a big comfy gaming chair.